Abbotsford – The Abbotsford Brain Injury Drop-In Program provides a safe and supportive environment where people with an acquired brain injury can find respect and dignity, while building positive relationships. Participants are encouraged to join in social/recreational activities such as outings and table games; they are also welcome to participate in planning or help with activities. Hours are 4 pm to 7 pm Wednesdays and 1 pm to 3 pm Fridays, except statutory holidays. 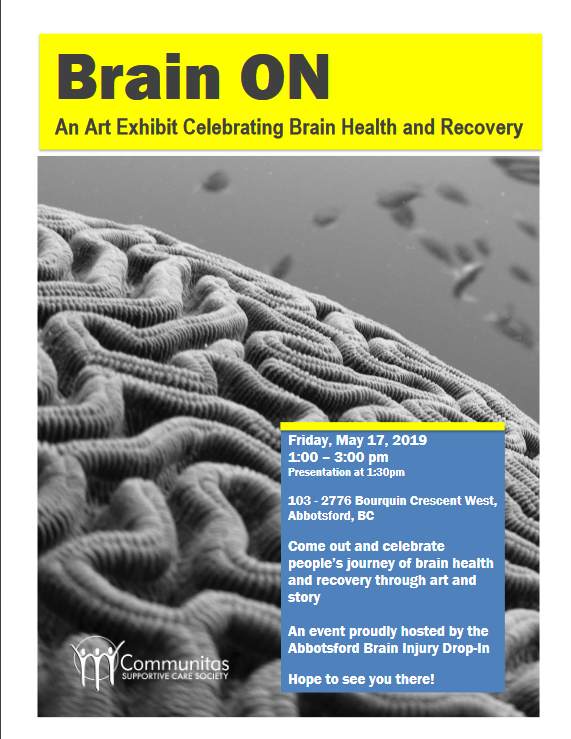 The Drop-In Program presents Brain On – An Art Exhibit Celebrating Brain Health And Recovery – Saturday May 17. This art exhibit celebrates those with brain injuries, from disease to trauma and their journey of recovery through art. This program is part of the Fraser Valley Brain Injury Association in Abbotsford, Chilliwack and Hope. Be the first to comment on "Brain On – An Art Exhibit Celebrating Brain Health And Recovery – May 17"